Lama Foundation is a spiritual community, educational facility, and retreat center adjacent to the Carson National Forest about 30 miles south of Colorado near the town of Taos, New Mexico. Designed as a community that embraces all spiritual traditions, it has strong ties to Taos Pueblo, the Hanuman Temple in Taos, NM, Sufi Ruhaniat International, Dervish Healing Order, The Church of Conscious Harmony, St. Benedict’s Monastery in Snowmass, CO, and dozens of other communities, spiritual teachers, and thousands of pilgrims from nearly all religious heritages who call Lama their home. 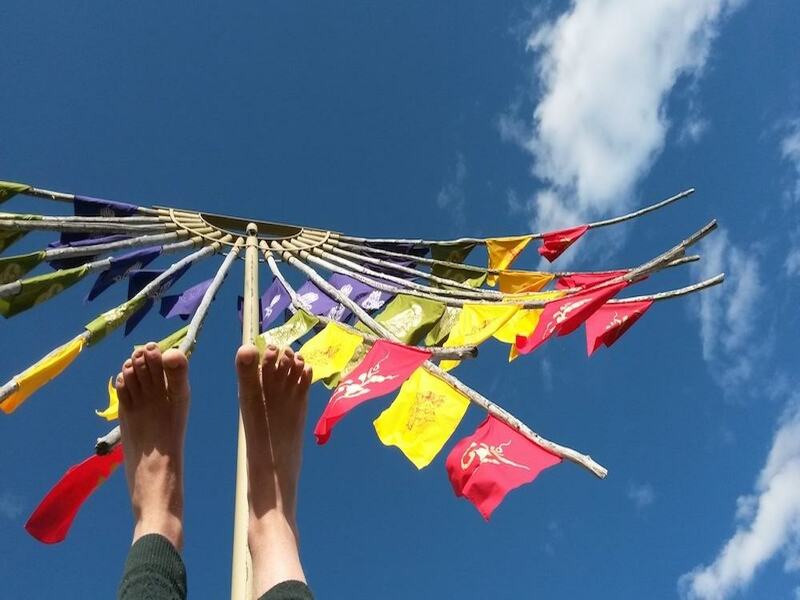 During the summer, Lama Foundation welcomes visitors and pilgrims from all walks of life to join the community and connect with the land. Retreats are offered, serving a wide range of spiritual languages and personal needs, from Women Singing in Circle to Co-Founder Asha Greer’s Vast Silence. Some guests may also find retreat space in one of Lama’s hermitages, or just enjoy a visit to the summer community, weaving the inner and outer wilderness into their own rhythm. 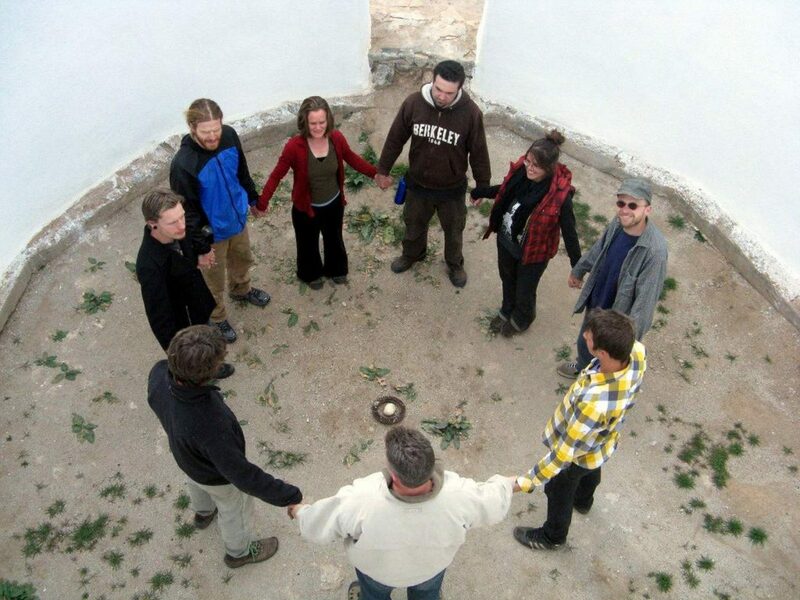 In the winter, Lama turns inward, giving the resident circle (a fluctuating group of about 8-15 men and women) the chance to pursue their own spiritual practices in relative peace and silence. During this time, residents participate in both solitary and group retreats, as well as plan and prepare for the coming summer schedule. Like a crew that sails a massive ship, the resident circle is responsible for nearly all of the daily workings of Lama Foundation, both in winter and summer, but their work is only possible with the enormous help from all the stewards, volunteers, donors, trustees, free associates and continuing members who make up the community as a whole, a community deeply connected to the Mountain, to spirit, and to every person who has come before and after. 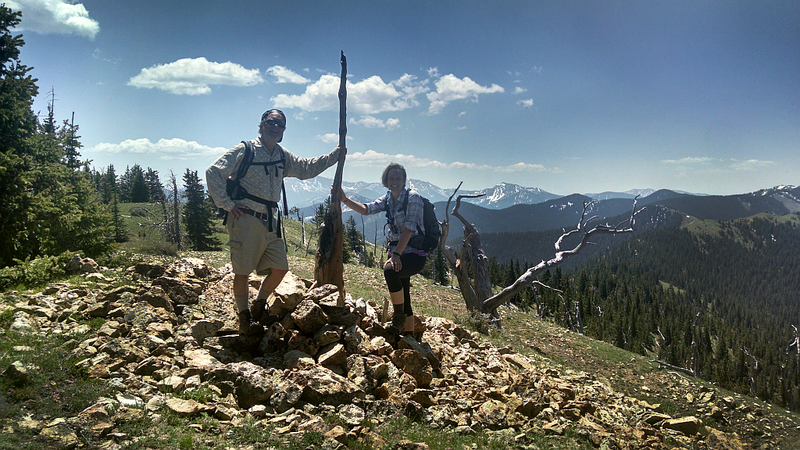 At 8,600 ft above sea level, Lama Foundation thrives adjacent to the beautiful and rugged 1.5-million-acre Carson National Forest in the Sangre de Cristo Mountains, the southern tip of the Rockies. The increased snow and rainfall of these mountains gives birth to a vast forest transitioning from fir and spruce at its highest elevation to ponderosa pine, scrub oak, juniper, pinon, and eventually petering out into sagebrush and chamisa on the valley floor, still 6,500 feet above sea level. At the valley’s center lies the majestic Rio Grande River, whose stunning gorge can be seen from Lama’s front porch. The abundant grasses, pine nuts, wild rose hips, and acorns attract abundant wildlife, including elk, mule deer, black bears, several species of rabbit, squirrels, rodents, non-poisonous snakes, red-tailed hawks, owls, wild turkeys, mountain bluebirds, migratory birds, bobcats, and the occasional mountain lion. Flag Mtn. is a steep four hour hike from Lama but the views are amazing. With respect for the earth that formed this gentle mountain, Lama strives to coexist with the animal and plant species that live here. While a connection to the land has been an integral piece of the Lama experience since its inception, a new orientation toward the tenets of permaculture began during the 1980’s. In the summer there are ripe apricot, peach, and plum trees to glean, along with plenty of fresh greens, herbs, tomatoes, squash, cucumber, runner beans, peas, and edible plant varieties of many kinds. We also participate in a local CSA for additional produce. Drinking water comes from Lama’s own mountain spring, and all grey water is recycled back onto the land. We get the majority of our electricity from the sun. While the community at Lama is always evolving, several key commitments form the container that allows for the rich development of the community and each individual on the mountain. Since Lama’s beginnings, daily meditation, a no-drugs/no alcohol policy, consensus decision-making, and a spirit of inquiry into one’s own spiritual practice have been the formative tools for individual and community development. 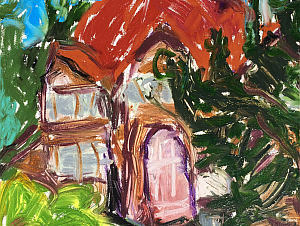 In response to these commitments, an intention has blossomed in the heart of community members to treat everyone and everything with love and respect as a unique being. But this is no light task, and the members of Lama strive toward this goal with humility in their hearts. 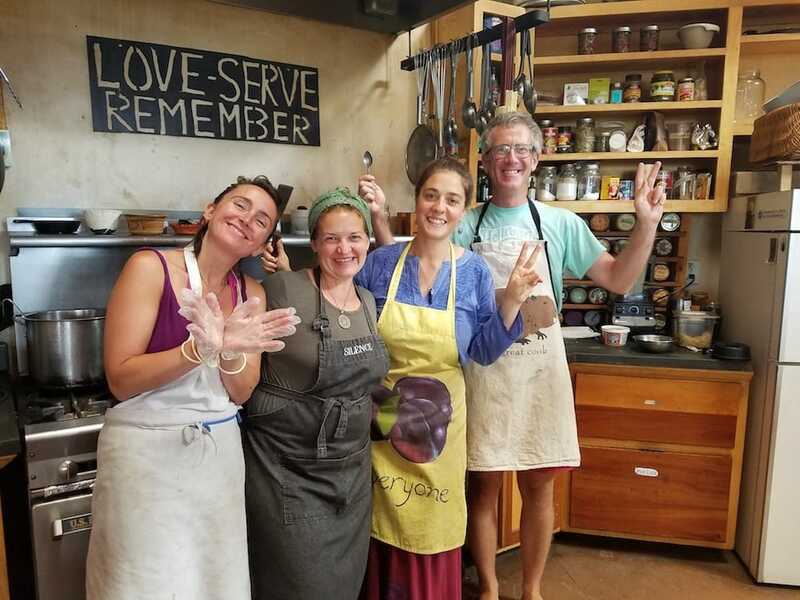 Support for this work comes from each other, and through the regular practices of Lama, including daily meditation, morning gatherings called “tuning”, the spirit of seva (selfless service), prayers before meals, weekly business meetings, heart club, Dances of Universal Peace, zikr, and Shabbat. 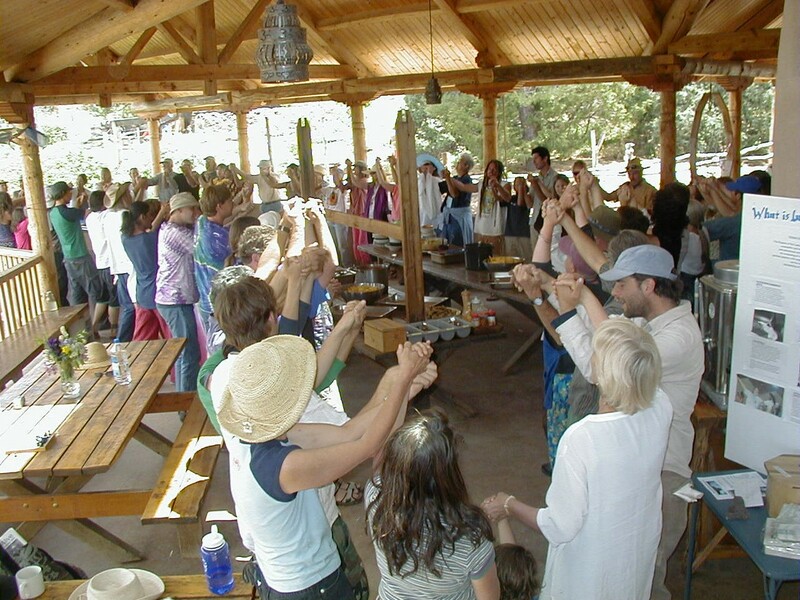 These core practices physically bring the entire community together several times a day, and though Lama honors the unique role and perspective of each individual, when the community joins hands and hearts to the land and Spirit, there is a resonant presence. Before visiting, please call us in advance. Due to a wide variety of circumstances, Lama Foundation is sometimes closed to visitors – especially from October through April.